From the multicoloured visions of Polish-German multi-instrumentalist and producer extraordinaire Waldemar Sorychta (member of bands such as Grip Inc., Voodookult and Despair) arises Enemy Of The Sun, who released this, their debut album, in 2007. It’s a shame that it didn’t properly hit my ears back then because Shadows is a very interesting slab of melting pot metal. The first thing that makes this album and the band very appealing to me is that Jules Näveri, very familiar from the ranks of powerfully rising Finnish headspinners Profane Omen, is handing the vocal duties in expectedly spectacular fashion. You want your soaring clean vocals with a few pinches of Layne Stayley, your ear-piercing screeches, your guttural roars – all is provided with seeming ease. As I hinted, musically this album is a serious laboratory of different elements. Technically stellar thrash with considerable death metal leanings is the foundation, as exemplified by cuts such as Emptiness, Weak (what a wicked opening riff) and Lost In Time (a real scorcher with some snappy melodic flourishes in the mix). The raging-to-soothing-and-back-again tempo changes and dashes of carnival-feeling via ethnic world music in tunes like Burning Bridges and Brain Sucking Machine shows why System Of A Down has been brought up many times in connection to this album. Clearly Surreal dabbles in Indian-tinged melodies in a manner that makes me think of The Beatles doing their Maharishi-inspired weirdness, only if they made that material very heavy and aggressive. The herky-jerky and rapid thrashing of Carousel sounds like Faith No More metallizing up its act about five-fold. Satisfied By Ego Purposes digs up the mouldy feel of old school Swedish death metal along with the appropriately infectious groove. Feel The Beating opens up with flamenco-style guitars and double kick-drums and keeps that melodic styling intact throughout the grooving heavy parts as well. So without going through each song, the ambition and variety throughout the record is immense. I’d dare say Shadows is the most ambitious metal record not reaching into the field of epic, symphonic metal that I’ve heard in a long time. The chock-full assault from this record leaves the feeling that a symphony orchestra and a massive choir were the only things the band didn’t try out, even though I’m sure there are oodles of instruments that say, your average folk metal band uses a lot that are not featured here. The album just leaves an immense feeling. Admittedly not every drastically different element melds together perfectly and parts here and there feel disjointed and leave some songs not that memorable, but the potential and drive here demands attention. The band plays cohesively through this multi-layered chaos and the production, while not overtly slick and polished, packs a mighty punch. Had I reviewed this three years ago, it surely would’ve been a surprise of the month so it is that now as well. 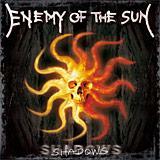 Enemy Of The Sun have already released their second album a few months back, so I’ll be reviewing that very shortly with considerable interest.